YAMAHA has always had an interest in the offroad market, but has never seemed to dip into the niche market categories. Until now. The YZ250FX is exactly that, it’s a bike which is aimed at a smaller segment of the market, “cross country”, closing the gap between a road legal WRF and motocross competition YZF models. The Yamaha YZ250FX is the hybrid many have been waiting for, as it takes key features from the Enduro based, fully registrable WR250F and motocross bred, championship winning YZ250F. The motocross bred YZ ‘F’ is the base which Yamaha started with when it began developing this bike. The ‘FX’ is aimed at the rider who rides a bit of motocross, but may also find themselves out in the Aussie bush riding a few cross country style trails. The first thing Yamaha threw at the FX were a few parts off the WR. A wide ratio six-speed gearbox, an 18 inch rear wheel and the all important electric starting system were immediately bolted up. From there Yamaha engineers and test riders set about tweaking the rest of the YZ components to build a more friendly and versatile package. The KYB SSS suspension was next on the list, on the outside the forks and shock are the same as the YZ, but on the inside Yamaha tweaked the valving to make it more compliant and supple over the small stuff and not so hard and harsh at the beginning of the stroke. Once down further in the stroke the FX begins to stiffen up, more like the YZ, to avoid nasty G-outs and hard hits. While working on the suspension and handling of the bike Yamaha developed a different style of engine mount. It doesn’t sound like much, but the FX engine mounts are made from a different material which gives different flex characteristics. Simply put, this goes hand in hand with the suspension to make the bike feel more compliant and easier to ride. The engine is not too dissimilar to the suspension in concept, it’s all YZ with a flair of WR thrown in for good measure. The YZ camshafts, piston and cylinder head design, complete the top end, with the WR gearbox, clutch and coil completing the bottom end. With the exception of the ECU, the rest of the parts, including the YZ exhaust, are common between the F and the FX models. The ECU takes on its own mould, with a setup that is specific to the YZ250FX. It features fuel and ignition mapping which is designed with all of the above combinations in mind, and the ability to plug in the GYTR power tuner. The braking system is once again a combination of parts. The rear brake features a WR rotor and caliper matched up to a YZ master cylinder and lever. This is claimed to give the ultimate mix of durability and power. The front brake system is a complete setup straight off the YZ. 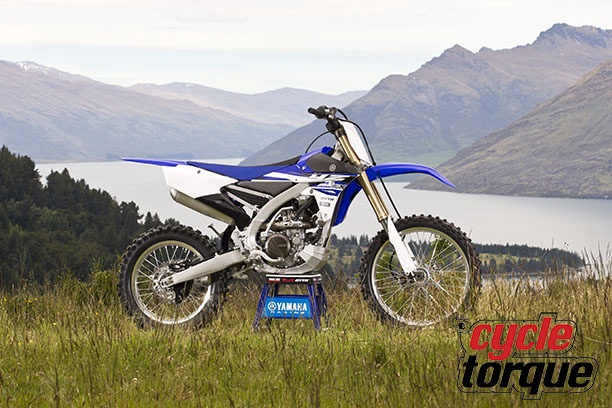 The YZ250FX is a very easy bike to ride. It has smooth and rideable developed into every aspect and it shows as soon as you get going up the first trail of the day. The six speed ’box and FX ECU somewhat transforms the power down low when compared to the YZ. It allows you to ride at much lower speeds and RPMs than normal without worrying about stalling and flaming out the engine, a great feature for when you’re crawling around rocks and hopping over logs where it chugs along much like a WR. Get it revving more, and it begins to open up, as its takes on a more free revving and lively top end. For most riders it will be every bit as good as the YZ, but for those who tend to ride close to the rev limiter, well the YZ over-rev can’t be beaten here. Overall, it has great power from top to bottom, with a strong pull right through the rev range. Someone who may not be as aggressive as an A grade motocross rider will probably find themselves faster on this bike due to its more rideable and less aggressive nature. The suspension and handling of the YZ250FX is, in one word, awesome. On our test it was really hard to fault the FX. It is a comfortable bike to ride, easy to adapt to and gain confidence on. Through the bush it was soft enough to absorb the small roots and rocks, and hopped over logs and trees without a hitch. Not having a skid plate as a standard item is a bit of a let down, but that’s really not much to complain about. We hit the track later in the afternoon and found a few jumps and some higher speed sections. The YZ FX held up well again and never wanted to blow through or bottom out once we really got things moving. 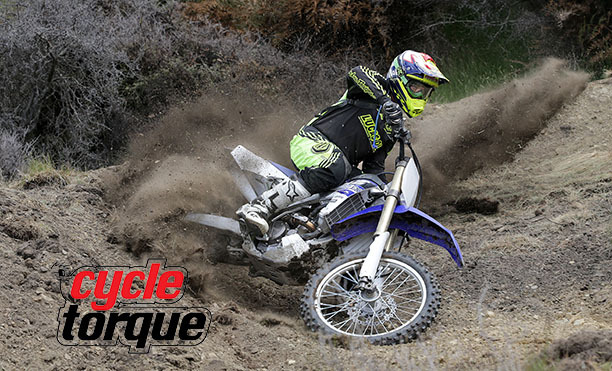 It’s surprising how versatile Yamaha has made the YZ250FX. With the change of a few clicks here and there on the suspension, the FX can be transformed from a very capable bike in the bush to a very comfortable bike on the track. The standard Dunlop AT81 tyres are relatively new to the market and are something we have never ridden with before. During our test we put these tyres through a fair pounding and walked away quite impressed with their grip and durability. FX owners would have no real reason to be changing the Dunlops out for some different rubber anytime soon. In our opinion, this is a fantastic concept from Yamaha. There are plenty of riders out there who have no use for a registrable bike, but aren’t out there cutting laps at their local motocross track every weekend either. If you’re one of those riders, than this is the bike for you. It’s fast and edgy, yet compliant and easy to ride. It’s built with Yamaha reliability and fitted out with quality components. For those who want a more WR styled bike, Yamaha offer a competition kit which comes complete with a headlight, tail light, horn, aluminium bashplate and plastic handguards.